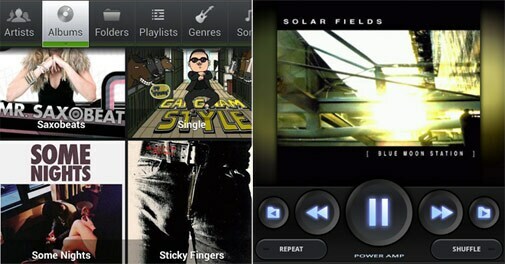 A look at the four top alternatives to your stock media player on Google Play. Does Metallica sound like N'Sync on the stock media player on your Android phone? Disgusted by the lack of album covers, and would you like lyrics to roll onto the screen every time your favourite song plays in your ears. Or do you simply want a welcome change from the same old dreary media player interface that keeps staring you in the face each morning? As with everything else Android, the Google Play store has an answer for this little predicament too. A lot of answers, in fact! A look at the four top alternatives to your stock media player on Google Play. Hate cluttered media libraries, where searching for your favourite track becomes as hard as searching for a needle in a haystack? We suggest you go for N7player, which visualises your music as a single plane full of album covers, enabling zooming in and out using multi-touch to see different views of your music. 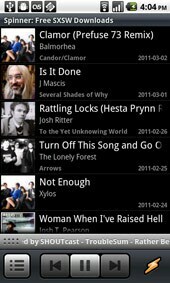 The main application screen is like an interactive tag cloud that can be easily explored to find your mp3 files. 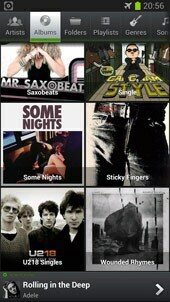 What's more, N7player smoothly transforms artist names to album covers, when pinched-to-zoom. Add to this the five-band graphic equalizer (only for Android 2.3 and above, though), gapless playback and extensive skin functions, and you have a winner on your hands! 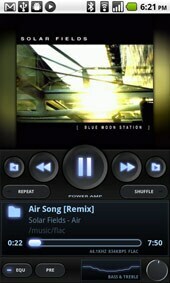 Poweramp, they say, delivers the most bass-y punch, and they aren't kidding. One of the highest rated media players on Google Play, little has happened over the last few years to bring the app down from its high perch. Features, you ask? For one, Poweramp can play nearly every format known to man - be it mp3, mp4, ogg, wma, flac, tta and aiff - and does it without complaint. Besides this, it has a 10-band optimised graphic equaliser (without any version-compatibility issues too), and features ranging from stereo eXpansion, mono-mixing, crossfade and dynamic queue to lyric views. Yes, your favourite PC media player can be your favourite smartphone media player too! And the fact that it has been the world's favourite desktop media player for years now helps, considering that you can use it play, manage and sync music from your Mac or PC directly to your Android device. Winamp Pro (yours for Rs 265) offers a complete music management solution, featuring - among other advantages - iTunes import and access to thousands of Internet radio stations with SHOUTcast. Getting Winamp gives you access to a 10-band graphic equaliser, customisable home screens, crossfade option and personalised station recommendations without the hint of an ad opening up anywhere. Old is Gold, eh? This media player doesn't believe in being gimmicky. It just remains what it is, a robust music player that will not let you down, carrying out basic functions while providing good, wholesome music. PlayerPro has been in the top five android apps in the music & audio category for over two years, and they are not kidding when they say that it is being actively being developed and supported. Name your complaint in the Google Play comments section, and the developer responds - or better still - corrects the problem immediately. A must buy if you like to play it safe and sound. Comes with a price tag of Rs 280.